Jim and Beth Did This 10 Years Ago!! In 2008 Jim and Beth Got on Their Camels and Did This!!!! TAKE A TRIP TO EGYPT WITH JIM AND BETH ALLEN!! Our trip to Egypt was fascinating to say the least! It is hard for an American — whose country is 233 years old — to fully comprehend a civilization so advanced – yet buildings that were 4900 years old! I must brag a bit on the reason for this trip. My son Tim had been studying at Georgetown University for his Masters Degree in Arabic Linguistics when he was awarded a one year scholarship through the State Department for a critical language program at the American University of Cairo. He started his education in Cairo June 1st, 2008. So Tim had been over in Egypt studying for 7 months before our visit. We all missed him dearly, and at the same time wanted to see the sights that Egypt offered. 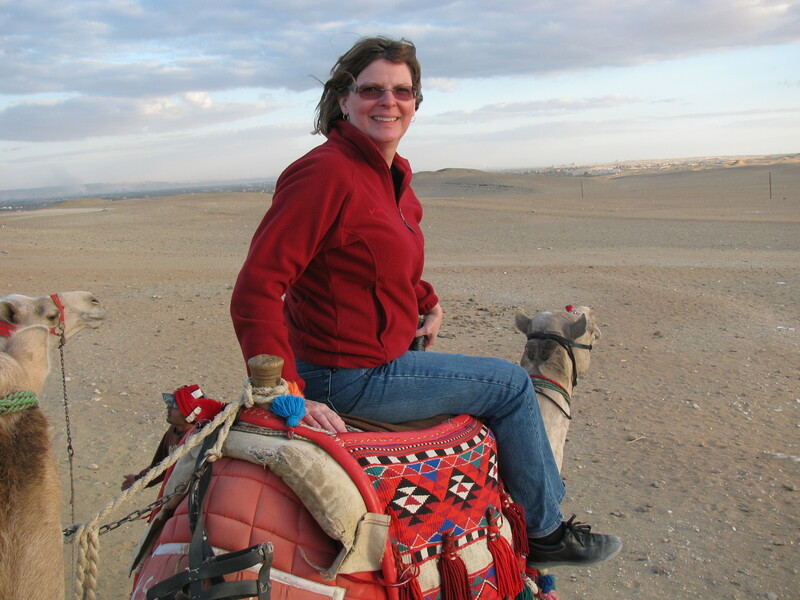 So we put Beth to work (she is really a part time travel agent) and decided to spend Christmas in Cairo. This was the best time not only since both of my sons were out of college at the time, but it was easier on Beth’s business and my business also. Beth and I traveled with my son Stephen on this trip, and of course Tim. Stephen had the unique experience of turning 20 in Cairo, Egypt! We landed in Cairo Dec. 22nd, 2008. It is impossible to describe the chaos they call traffic, yet the taxi drivers are very helpful and if you hold on tightly you arrive safely to each destination. Our first tour was Tim’s University — the American University of Cairo. We sampled our first taste of Egyptian food here. As impressive as the buildings are, the food in Cairo is not held to the same standards. The following day we visited the Egyptian Museum in Cairo. It would take days, weeks perhaps to fully visit the artefacts stored in this museum. Most of the items found in King Tut’s tomb are exhibited here. It was perhaps the most intriguing museum I have ever visited, although I still have a special place in my heart for the British Museum in London. The following day we visited the Pyramids. It’s hard to imagine that the Great Pyramid was the tallest building built by man until 1889 when the French designed the Eiffel Tower almost 5,000 years later! They are impressive in books, more impressive in person. The 4 of us enjoyed a one hour camel ride around the 3 Great Pyramids in Giza, and ended up in the front of the Sphinx statue. I believe we all agreed this was the highlight of the week. We then got adventurous and booked a sleeper train to Luxor, 447 miles south of Cairo. While in Luxor we toured the Luxor temple, Temple of Karnac, and The Valley of the Kings. Each is impressive in its own right; however I was particularly stunned by the Valley of the Kings. You are allowed to tour 3 of the King’s tombs with your ticket – each of the tombs is unique enough yet still indescribable in beauty. The hieroglyphics are so well preserved, as are the drawings on the walls. The tombs have been ransacked by thieves over the years, which is what made the discovery of King Tut’s tomb in 1922 all the more significant. Since his tomb was actually under another, it went undetected by thieves and therefore was the only tomb with all the treasures still inside. We returned back to Cairo for one last day, visiting the Citadel mosque as well as the local marketplace. The people in Egypt could not have been any kinder to us, and although the country is 90% Muslim and 10% Christian they work side by side in peace and harmony. In fact, we were shocked to see so many Christmas decorations in the hotel and shops! It was a trip however that would be impossible to take without an Arabic speaking tour guide. We do however recommend that anyone interested in this unique historical country please visit Egypt. It will be a trip of a lifetime, as it was for ours! See pix in margin: That is Beth on the Camel and from left to right in the other pic, Stephen, Tim, Jim, and Beth Allen. Submitted by Jim and Beth Allen. 2009-01-14. 1 Response to Jim and Beth Did This 10 Years Ago! !